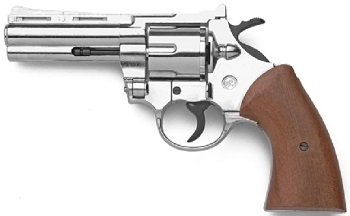 Image Below Or Add To Cart Colt Python 4 357 Magnum 9MM Blank Firing Gun Replica, now available in Nickel: The Python 4 357 Magnum blank-firing reproduction fires six (6) loud .380 caliber blanks and features a 4" vent ribbed barrel. This famous classic Detailed Replica police model fires single or double action as fast as you can pull the trigger. The cylinder swings open to reload and the shell extractor works. Item Features: Caliber: .380 Fires 9MM Blanks, Finish, Black, Length 9” overall with a 4” Barrel, Weight 2 Lbs, Wood Grips Single or Double action. Comes with a Hardshell Carry Case: This Blank Firing Revolver fires our regular loud 380/9MM Blanks or our quieter 380/9MM Half Load Blanks. The half loads are if you need a quieter shot. You can buy either or both just below here. For the quietest blank gun in a small theatre setting you may want to purchase a 6MM/22 Blank Gun.